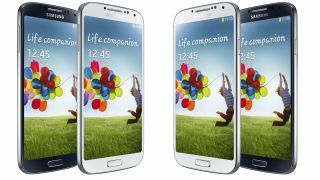 We already know the US and Europe won't be getting treated to the ludicrous octa-core Samsung Galaxy S4, but now the fact has really been rubbed in our faces. A SamMobile 'insider' and GSMArena have put the latest versions of Samsung's latest flagship handset through some benchmarks tests and the eight core S4 didn't just beat its quadruple-toting brother, it obliterated it. The international Galaxy S4 (GT-I9500), which sports a 1.6GHz Octa processor but no 4G connectivity, managed to rack up the impressive score of 28,018 on Antutu - a popular Android benchmarking application. Meanwhile the handset destined for the US and UK (GT-I9505), packing a 1.9GHz quad-core chip and 4G, only posted 23,607 on the same test. It's also been suggested that the eight-core Galaxy S4 will actually produce better power efficiency thanks to ARM's big.LITTLE technology - reducing fears of a fast draining battery. According to Antutu's ranking page the Galaxy S4 is in a league of its own with rivals such as the Google Nexus 4, Galaxy Note 2, Galaxy S3 and HTC One X+ all registering scores of below 20,000. Is it right that Samsung is denying certain markets the chance to get hold of the more powerful - and possibly more efficient - Galaxy S4 or is this talk of eight cores just simply ridiculous? One member of TechRadar certainly knows where he stands.